Silvermist Mountain Lodge & Wine Estate is ideally situated discreetly on the woody slope of the Constantiaberg - a jewel in the crown of the Table Mountain National Park. Silvermist Mountain Lodge Estate is definitely in a class of its own. 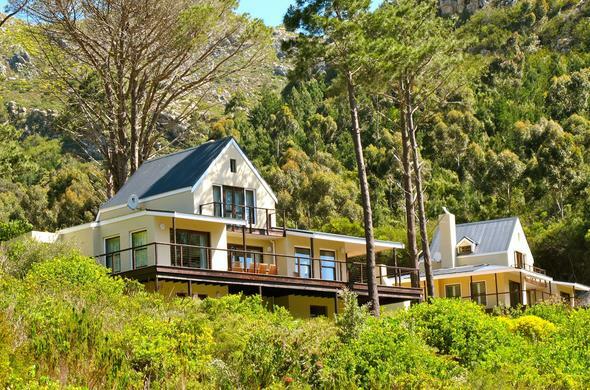 Well positioned on a private 52-acre organic Wine Estate in the heart of the Cape Peninsula, the private estate is located close to Claremont, city centre, V&A Waterfront, all of the Cape beaches and the winelands. Each cottage has its own cosy lounge with fireplace, fully equipped kitchen, elegant bedrooms and bathrooms with all the special features required to make this your special Cape home. Enjoy breakfast in the cosy Tree house with superb views of the mountains and Hout Bay valley. Allow the fresh mountain air to envelop you, hear the tranquil sounds of nature about you, watch the evening mist trial up the longkloof valley below you, this is Silvermist, a most exclusive estate nestling high on the forested slopes of the Constantiaberg. In the Silvermist Mountain Lodge Estate, you will find peace and tranquility in beautiful natural surroundings. During the summer, protected from the prevailing trade winds, spend a lazy day barbequing or beside the swimming pool designed to create the feeling of a natural mountain pool. During winter, sip wine from one of the well known local wine estates of Constantia while sitting in front of your own log fire and watch the evening light fade across the valleys. Later drive down to one of the many exciting restaurants close by. Excellent conference and function facilities are offered to meet corporate client's standards.